"This is a great contribution to the diversity and inclusion efforts being made in healthcare today." The UT Graduate School of Medicine has established the Academy of Scholars, an initiative based on prior work by the Carnegie Foundation to promote academic excellence among faculty physicians. The Academy members and its initial goals were introduced in the last issue of The Scope. Current Academy agenda items are creating a multidisciplinary educational bootcamp for incoming interns and solidifying methods of recognizing and rewarding our best resident educators at the intern and resident level. "As faculty, we have not necessarily had formal training in how to be the best educators. To be an excellent educator takes dedication and practice, just like tying knots or performing an operation." The inaugural members have earned membership in the Academy of Scholars not only through their own commitment to medical education but also because reviewers at other medical institutions believe them to be the best academic leaders and educators on this campus. In this and future issues of The Scope, members will share what they see as the importance of the Academy and what they hope to accomplish through the organization. James Lewis, MD, Chair of the Academy, is a surgical oncologist specializing in skin cancer, sarcoma and breast cancer. An Associate Professor in the Department of Surgery, he is also Clerkship Director for medical students and Assistant Program Director of the General Surgery Residency. 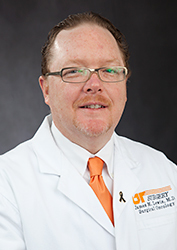 Dr. Lewis sees the Academy as an opportunity to build up physicians at The University of Tennessee Medical Center as clinicians and educators. "As faculty, we have not necessarily had formal training in how to be the best educators. To be an excellent educator takes dedication and practice, just like tying knots or performing an operation. The Academy is a way for physicians who have been identified as excellent educators to come together, look at best practices, and then build up our other faculty members and even residents as teachers. "In addition to being educators, we also need to support our physicians in their practice. That's why one of our initial goals is wellness and prevention of burnout." "In my opinion the health of the GSM and the medical center depends on recruiting, teaching and mentoring our residents." Robert Craft, MD, is a Professor in the Department of Anesthesiology. He is the Department's Vice Chair and Residency Program Director, and he directs departmental research, the neuroanesthesia section, and the preoperative clinic. He said, "I believe the importance of AOS is that it serves to distinguish and recognize faculty members who have contributed greatly to the teaching and investigative environment of UTGSM. 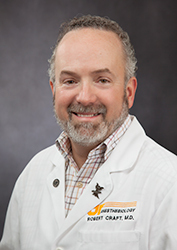 Previously these individuals have been recognized at their departmental levels, but doing so at the institutional level serves to illuminate the importance of these roles to the health of UTGSM and The University of Tennessee Medical Center." "In my opinion the health of the GSM and the medical center depends on recruiting, teaching and mentoring our residents. These activities are the direct requirements for graduate medical education, and I believe these activities also result in an environment that results in the best patient care." Dr. Craft also believes the Academy is a means of bringing best practices in medical education the UTGSM which ultimately will affect patient care, not only because of the care provided by the faculty physicians but also because the residents and fellows receive top-notch training. Look in the next issue of The Scope for perspectives from Academy members Brian Daley, MD, and Mitchell Goldman, MD. A new protein generated by researchers at the UT Graduate School of Medicine to image amyloid, a substance associated with Alzheimer's and type 2 diabetes, may be put to another novel use as a tool in an investigation to more accurately diagnose, and potentially treat, liver tumors. The protein, named p5, was developed by a team of researchers led by Jonathan Wall, PhD, director of the Preclinical and Diagnostic Molecular Imaging Laboratory. It is being researched with the help of funding from the National Institutes of Health. 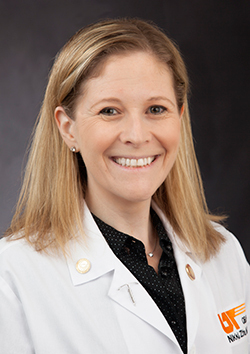 P5 and related peptides have now gained the attention of Laura Findeiss, MD, Associate Professor and Chair of Radiology, at the UT Graduate School of Medicine. Dr. Findeiss said that she and Dr. Wall are examining the protein as a way to diagnose types of liver tumors using PET imaging. Several distinct types of tumors can develop on this organ, either metastasizing from another part of the body or evolving in the liver cells themselves. Knowing a liver tumor's type is critical to treating it, and Findeiss is searching for minimally invasive image-guided techniques that can help in diagnosis. If the effort is successful, p5 will bind to tumor cells so that the cells light up in PET scans. This will allow radiologists such as Dr. Findeiss to diagnose the type of liver tumor a patient has more accurately and to prescribe the most effective treatment plan. In addition to imaging tumors, p5 may also enable Dr. Findeiss to better treat patients by "microtargeting" tumors with radiation. Traditionally, chemotherapy is delivered through the bloodstream, but the problem is that the chemicals are carried throughout the body, not just to the affected tumor tissues. Using agents, such as p5, that bind to tumor cells, physicians can target cancer therapy directly to malignant tissue, saving healthy tissue throughout the body and providing a better outcome for the patient. Dr. Alan Solomon (center) led research at the UT Graduate School of Medicine for more than four decades. Alan Solomon, MD, retired from the University of Tennessee following 47 years of practice in medicine and research that focused on saving the lives of people affected by amyloidosis. 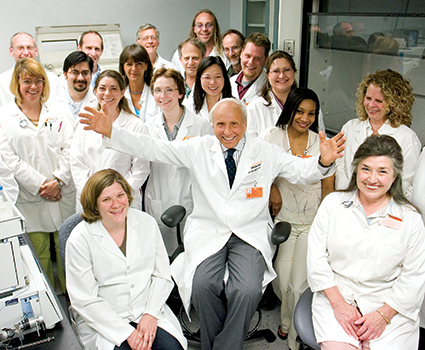 During his tenure at UT, Dr. Solomon served as a Professor in the Department of Medicine and as the Director of the Human Immunology and Cancer Research Program. He held National Institutes of Health grants for four decades and maintained a very successful clinical practice. In 2011, he won a Knoxville News Sentinel Healthcare Heroes award for innovation. Read more on knoxnews.com about how he has served as a mentor to practicians and researchers and the legacy he leaves behind. Faculty in the Department of Medicine were recognized at a departmental awards reception. 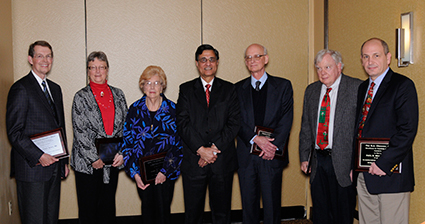 Several faculty members received awards at the Department of Medicine's Annual Faculty Recognition Dinner in December. Alan Solomon, MD, received the Beasley Pylon Award in recognition of his outstanding efforts in building research within the Department of Medicine and for his world-renowned contributions to amyloid research. The R.A. Obenour, M.D., Distinguished Alumnus Award was presented to Wahid Hanna, MD, for his successful career in the fields of hematology and oncology. The London Award, given to a faculty member who shares a dedication to excellence, was presented to Jerry Crook II, MD. The recipient of this award is chosen by the residents. The R. A. Obenour, Jr., Award, given to a faculty member for steadfast dedication to excellence in teaching, was presented to Paul Branca, MD. 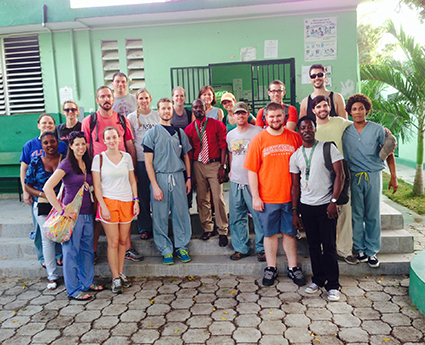 Faculty, residents, and medical staff participating in Project SHOUT in Haiti with the local hospital administrator Dr. Dimmy Harard (center). 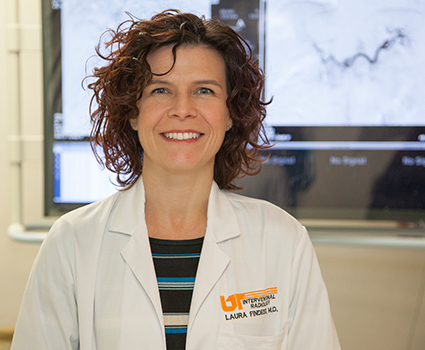 The Physician's Medical Education and Research Fund at The University of Tennessee Medical Center recently awarded grants for several research projects at the UT Graduate School of Medicine. Also, four area students are receiving tuition support for their advanced degrees in various fields of medicine. Surgery residents Juan Gallegos, MD, and David Jeffcoach, MD, are studying "Evaluation of the Utility of Cardiopulmonary Resuscitation versus Fluid Resuscitation Alone." John Bell, MD, Professor of Surgery, and Derek Hopko, PhD, UT, are studying "Promoting Life Management (CALM) through Integrative Healthcare." Craig Towers, MD, Associate Professor of OB/GYN, is researching "Clindamycin Levels in the Mother and Neonate following Administration in Labor for Group B Strep Prophylaxis." Preclinical and Diagnostic Molecular Imaging investigators Stephen Kennel, PhD, Jonathan Wall, PhD, and Emily Martin are researching "Imaging and Targeted Alpha Particle Radiotherapy of Metastatic Melanoma in Mice." Eric Carlson, DMD, MD, Chair, Oral and Maxillofacial Surgery, Paul Hatcher, MD, Associate Professor, Surgery, and Maria Cekanova, UT Veterinary School, are investigating "Isolation and Characterization of Human Primary Cancer Cell lines to evaluate Novel Therapeutic and Imaging Agents In Vitro." Many research and educational projects have received their initial support from PMERF funds. PMERF has been providing support for educational tuition and research projects since the 1960s. Funds are provided by donations from members of the medical community and other entities. In the past 10 years, PMERF has provided $680,000 in support for research proposals and $300,000 in tuition support for students participating in advanced degree programs in medicine. 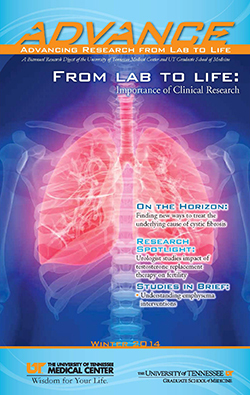 A Medical Humanities series has launched at the University of Tennessee Medical Center. This series is being coordinated by Annette Mendola, PhD, Instructor in Medicine's Division of Clinical Ethics and Director of Clinical Ethics, and Woods Nash, PhD, from the Department of Philosophy at the University of Tennessee, Knoxville. Medical Humanities is a rising program that is developing throughout the nation as an important aspect of medical professionalism. Medical Humanities is an interdisciplinary program that combines humanities, social sciences, and the arts and their application to the medical field. The purpose of this program is to use the humanities to look at medical practice through a different lens. The series at UT includes the following lectures for Spring 2014. Lectures are monthly on the third Wednesday from 5 to 6 p.m. in Morrison's Conference Center. Briana Rader is a pre-med student at the University of Tennessee, Knoxville, who is participating in the College and Haslam Scholars Program. She has previously spoken at the Preston Medical Library for their July Literary Rounds. This lecture is based upon the works of best-selling author Cormac McCarthy, best known for writing No Country for Old Men. Dr. Nash is a member of the Department of Philosophy at the University of Tennessee, and Dr. Morgan is a faculty member at the University of Tennessee who practices in the university's Psychology Clinic. In Readers' Theater, the performers read from a script and have limited movement across the stage, leaving much to the audience's imagination. The program creates an atmosphere that encourages discussion among the audience about the pressing medical issues of today. 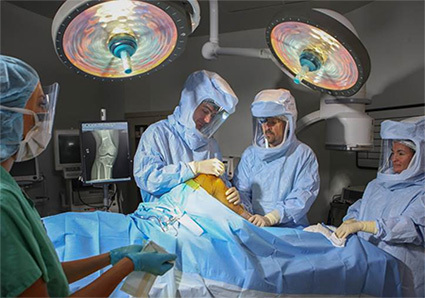 To best meet the fast growing needs in the region for joint replacements as well as treatment of fractures, traumatic injuries and sports-related concerns, officials at The University of Tennessee Medical Center announced the formation of the Advanced Orthopaedic Center. The center represents an expansion of the medical center's nationally recognized orthopaedic care and will coordinate the full spectrum of patient and community education and diagnostic and treatment modalities for orthopaedic issues. According to Joe R. Landsman, Jr., President and CEO of The University of Tennessee Medical Center, the medical center has more than doubled its number of knee and hip replacement cases in the past five years. Additionally, Landsman said, the medical center encountered a sharp rise in the number of patients suffering from arthritis, traumas, sports injuries and broken bones. In the past year, the medical center added several specialists to its orthopaedic group, including orthopaedic physicians specially trained in trauma care. The medical center now has five operating room suites dedicated to orthopaedic cases. Education and Prevention Services (to include Osteoporosis, Falls Prevention and Surgery Preparation). The Advanced Orthopaedic Center becomes the medical center's sixth Center of Excellence, joining the Brain & Spine Institute, Cancer Institute, Center for Women and Children's Health, Emergency and Trauma Services, and Heart Lung Vascular Institute. For more information about the Advanced Orthopaedic Center and available orthopaedic services at the medical center, call (865) 305-8388. At the latest American College of Physicians Tennessee Chapter Scientific Meeting in Franklin, Tennessee, Ryan Kerr, MD, Third-Year Medicine Resident, won second place for his poster presentation, "Invasive Procedure Training Requirements of Internal Medicine Residencies - A Survey of Internal Medicine Program Directors." Also winning a second place award in the narrative medicine competition was Max Rajan, MD, Second-Year Medicine Resident, for his short story, "Speaking Human." Donna Doyle, Poet-in-Resident at Preston Medical Library, and Ronald Lands, MD, Associate Professor of Medicine, served as judges to the narrative medicine competition. They have been instrumental to the narrative medicine curriculum in the UT Graduate School of Medicine.